カンタータ 第51番《全地で歓呼して神を迎えよ》 BWV51: Aria: "Jauchzet Gott in allen Landen"
カンタータ 第51番《全地で歓呼して神を迎えよ》 BWV51: Recitativo: "Wir beten zu dem Tempel an"
カンタータ 第51番《全地で歓呼して神を迎えよ》 BWV51: Aria: "Höchster, Höchster mache deine Güte ferner alle Morgen neu"
カンタータ 第51番《全地で歓呼して神を迎えよ》 BWV51: Chorale: "Sei Lob und Preis mit Ehren"
カンタータ 第51番《全地で歓呼して神を迎えよ》 BWV51: Aria: "Alleluja"
5つ星のうち5.0Spiritual exaltation captured perfectly in these two up-tempo Baroque works of the master. I downloaded this album onto my Kindle because it has the fastest and most exciting tempos of both pieces combined with absolute precision of diction and spot-on pitch. 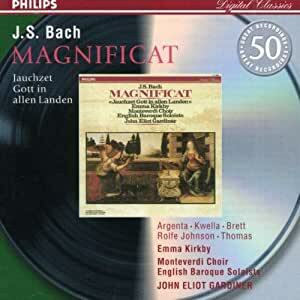 It took me awhile to adjust to the lowered pitch of the period instruments performing the Magnificat. And comparing the clear-as-a-bell performance of Emma Kirkby in the cantata to my very old LP with Elizabeth Schwarzkopf only makes me realize how out of her element the earlier German soprano was in attempting Bach . . . she should have stuck with the Marcellin in Rosenkavalier, the signature role through which she was best known . . . . and how much better Emma perfectly conveys the excitement of Bach's religious fervor. The trumpet obbligato is less satisfactory but is probably being played on a natural instrument, which would explain the small lapses of accuracy. As in other mp3s I've downloaded to my Kindle, often the only available versions of various pieces, what I miss most are the voluminous program notes written on the CD inserts and, before them, the backs of the LP albums. It really helps to have the German-English translations available along with facts about the performers, the composers, and the occasions of the compositions. Those criticizing the lack of "spirit" in this performance are simply missing the "Romanticism" of Bernstein, Ormandy, etc. There is the to-be-expected up-tempo of period instrumentation and interpretation of course. Some reviewers here just do not like early music instruments and forces and crave the lush interpretations prevalent before the 1980s. New-comers should expect smaller forces and quickened tempos. I suggest those new to this style and sound try one of the earliest of the period-style performances: Christopher Hogwood's "Messiah." This was my introduction, and it is so clean and bright, especially with Hogwood's use of a boy's choir in lieu of a an adult choir. This disc, well recorded in 1983, contains two fine performances given by a well balanced set of soloists in the Magnificat and some fabulous singing from Emma Kirkby in the cantata. The solo trumpet playing in the cantata deserves special mention and it is a grave error not to list such an important solo player who is treated on a par with the vocal soloist in the opening and closing sections. The main attention will almost certainly focus on the Magnificat which receives a generally swift reading of the choruses but not to excess. This enables the choir to enunciate clearly and still achieve considerable verve in delivery. All the soloists perform well and this is an excellent performance of a work that should thrill. Bach clearly intended it to have considerable impact and scored it with that in mind. The English Baroque Soloists are a fine group of musicians who play accurately and with good tone. This applies to all the sections of the orchestra but in this case it needs to be added that the three trumpets play in such a way that they would surely have delighted Bach. Bearing in mind the adverse remarks made elsewhere about the sopranos in the Magnificat and also the recording balance, I have checked these issues carefully and can only report that no such problems can be detected on my own playback system, even when alerted. The equipment is good enough to be merciless with inadequate technology and, as a trumpet player, I have played the work myself and can find no fault in this performance, only plenty to praise! Apart from the obviously short playing time of just under 42 minutes, this disc offers splendid music making and is well recorded. I would therefore suggest that it is well worth considering as an attractive purchase even with the proviso about the playing time. The first thing to say is that whatever you think of these performances, be careful what you pay for a disc amounting to only 41 minutes of music. I find one of the works much more successful than the other, and I actually suspect that the composer may have as much to do with that as do the performers. The Magnificat (here in its more familiar D major version) simply does not strike me as being equal in inspiration to the best of the cantatas, such as no 51, and to whatever extent this may be a valid view the recording (certainly) and the performance (possibly) conspire to reinforce it. You may experience a slight problem in setting the best volume-level for the Magnificat. The setting that suits the arias best may make the opening chorus uncomfortably loud, and at any level the solo voices seem a little backward. This is not as serious a matter at it would be in Handel or Mozart, since Bach's inspiration is basically instrumental with the voices integrated into the instrumental pattern, and in fact my ear became accustomed to it quickly. All the same, I did not sense quite the level of inspiration and fervour that I have found in most of Gardiner's Bach performances. Everything is basically `right', and these performers are eminent Bach stylists, but they have set the standard of comparison that I go by, and I have heard them in better form than here. The choral sound in particular lacks the ultimate degree of clarity that I would have liked and that I am used to from these singers. Cantata 51 is another matter entirely. This is simply superlative. I adore Emma Kirkby's voice, she is at her very best here, the recording has brightness and immediacy, and the whole performance is on fire. The only date mentioned in the liner is 1983, so presumably that was the year of both recordings, which makes the discrepancy in quality a little puzzling. The liner essay makes the excellent point that Cantata 51 is a kind of solo motet, Italian in origin, and I am familiar with the style from the much more Italianised Handel. The German school had by Bach's time naturalised the style completely, and to complete the Lutheran feel of the work Bach inserts a long and most beautiful and elaborate chorale. What the liner has to say about the music is very good and enlightening, so more's the pity that it squanders so much of its space in telling us that the music does this then that then the other, all of which we can hear perfectly well for ourselves. 4 stars may be slightly generous, given that the amount of music provided is far from generous. However it's possible that no performance at all could turn the Magnificat into Bach's finest effort, and there is nothing seriously amiss with this performance anyway. As for Cantata 51 as done here, I would have paid any asking price for it.